The combined experience of this family owned and operated business is the basis for the efficient, affordable solutions we offer to our clients. President and owner of ASTEC, Inc., with main offices in Middletown, Delaware. 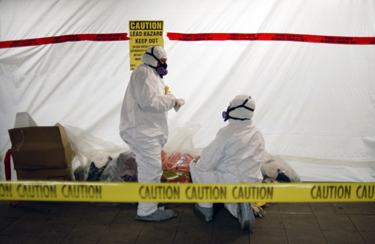 The services provided by ASTEC include asbestos abatement, mold, and lead remediation. Over twenty years of multifaceted experience is the foundation of Io's financial guidance, human relations programs, and management of new initiatives. Vice president of ASTEC, Inc. Responsibilities include operations and estimating oversight. Years of experience with asbestos-containing building materials is the springboard for remediation services and products offered to ASTEC's clients. Superintendent of ASTEC, Inc. Responsibilities include estimating and on site supervision of staff. Joe possesses over twenty years of supervision of HVAC insulation projects. Removal of asbestos insulation products was often an integral part of the process.